The Karuah catchment is on the NSW mid north coast directly north of the Hunter catchment. Bordered by the Manning River catchment in the north, and the Hunter River catchment in the south and west, the Karuah catchment area is 4,480km2. Extending 20km upstream from the coastline, the middle section of the Karuah valley comprises the middle and lower reaches of the river, floodplains and adjacent rolling lands. This zone, characterised by wide river valleys in the lower reaches (up to 7km) and narrow valleys in the higher reaches (1.5km), drains the extensive system of north-south ridge lines. The upper valley is characterised by narrow valley floors (less than 1km) bound by steep ridges, and consists of the upper reaches of the Myall and Karuah Rivers. Coastal features of the Karuah catchment are characteristic of a 'drowned' coastline. A system of lagoons, including Boolambayte, Myall, Smiths and Wallis Lakes, are present between the hinterland and the coastal dune barriers. The most populous areas in the catchment are around Port Stephens – a region experiencing significant growth. Other major centres in the catchment are Forster/Tuncurry, Bulahdelah, Karuah, Hawks Nest and Nelsons Bay. Three major river systems drain the Karuah River basin. The Karuah and Myall rivers drain south to Port Stephens, while in the north, the Wallamba, Wallingat, Wang Wauk and Coolongolook Rivers drain east into the northern part of Wallis Lake. 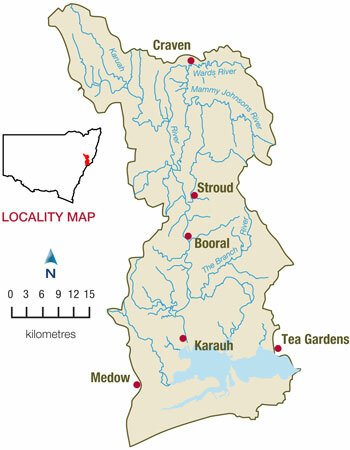 The Karuah and Myall Rivers are roughly parallel, reflecting the strong north-south orientation of the topography of the inland part of the Karuah basin. An extensive belt of coastal riverine plains extends inland for up to 20 kilometres over the Myall and Karuah floodplains. View real-time data from the Karuah catchment on this website. Since the decline of the dairy industry, agricultural land use has been mainly beef cattle production. There are also a number of poultry farms in the catchment. Other major water users include Hunter Water Corporation, local councils, the oyster farming and fishing industries. Recreational fishing, linked with the prominent and fast growing tourism industry, is also a popular activity in the catchment. 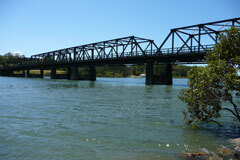 Most rivers and creeks in the Karuah River Basin are unregulated, without major storages to capture and control flows. Most water users rely on natural flows or small structures, such as weirs. As in most unregulated rivers, flows are most affected during relatively dry times, when water is less and demand high. The rapid development of the tourism industry in the region is mainly due to its proximity to Sydney and Newcastle, as well as the attractive climate and the aesthetic value of the area. The continued pressure of development, however, has led to water quality issues such as the bacteriological contamination of Wallis Lake. Open-cut coal mining is relatively new to the area, and strict controls will be required to prevent increases in salinity levels in the creek. NSW State Forests manages 20 per cent of the area for multiple usage, including timber production, grazing, and conservation. Similarly, the National Parks and Wildlife Service manages approximately 10 per cent of the total catchment area, with most of this land located in the Myall River National Park. To preserve water resources in river and groundwater systems in the long term, it is critical to balance the competing needs of the environment and water users. Water sharing plans establish rules for sharing water between the environmental needs of the river or aquifer, and water users, and also between different types of water use such as town supply, rural domestic supply, stock watering, industry and irrigation.